The CO2 absorption in a lab-scale fixed solid bed reactor filled with different solid sorbents has been studied under different operative conditions regarding temperature (20-200°C) and input gas composition (N2, O2, CO2, H2O) at 1bar pressure. The gas leaving the reactor has been analysed to measure the CO2 and O2 concentrations and, consequently, to evaluate the overall CO2 removal efficiency. In order to study the influence of solid sorbent type (i.e. CaO, coal bottom ash, limestone and blast furnace slag) and of mass and heat transfer processes on CO2 removal efficiency, a one-dimensional time dependent mathematical model of the reactor, which may be considered a Plug Flow Reactor, has been developed. The quality of the model has been confirmed using the experimental results. ISNAD Donatini, Franco , Landi, Michele , Schiavetti, Massimo , Riccardi, Juri , Gabbrielli, Roberto . "CO2 Absorption in a Lab-Scale Fixed Solid Bed Reactor: Modelling and Experimental Tests". 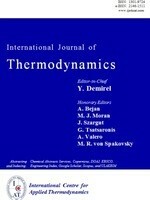 International Journal of Thermodynamics 7 / 3 (September 2004): 123-130.